In 1851, the census was more specific about some occupations and we can obtain a clearer idea of the nature of work in the parish. The general term Labourer was replaced by a more specific agricultural labourer. That still covered all who were casually, seasonally or permanently in the employ of the tenant farmers. Land owners could still commandeer labour from their tenant farmers for work on roads or woodland as occasion demanded. Most households still contained at least one plaiter for the straw hat trade, supplying their output to the various factors on market day in St Albans, or directly to the early factories being built there. Among those undertaking this home work were five Brazilian hat makers. This implies a more advanced and skilled trade of using straw that had been dyed, and finishing the hats in one or more colours. Husband and wife William and Elizabeth Berry had taken over responsibilities at the toll gate house. Education has come to the parish, with the wife of an agricultural labourer, Susan Reynolds, describing herself as a school mistress, perhaps at Colney Heath School which had opened its doors in 1814. Attending the same school may have been 9-year-old William Wright, possibly grandson of a local corn salesman, for against his name was the word school. The early census returns to not provide clues to specific dwellings, but Thomas Wyker was working as a gamekeeper here; Mary Gibbs and Mary Rau were both taking in washing. Joseph Webb, the 17 year old son of agricultural worker James Webb, had, it seems, been taken on by Edward Lines at the blacksmith’s shop. Abraham Dearman, an out pensioner from the Chelsea Hospital had arrived to become a victualler. This is presumed to be at the Tom & Jerry beer house on the north side of Hatfield Road, otherwise he would have been listed next to Edward Lines at the blacksmith’s next door to the Three Horseshoes. It is possible that the fortunes of the Three Horseshoes had taken a tumble, for its previous tenant, William Simpkins, had become an agricultural labourer. In the spring there is an uptake of farm work and if the major part of his work was in the fields, he would have described himself thus in the April census, rather than a publican. Cattle may well have been a more important agricultural resource in the 1850s. Abraham Dearman’s son was a cattle dealer, and his two younger sisters described themselves as dressmakers. This may have been a significant occupation in rural districts, when an occasional new item of clothing was required, and everyday clothes would need altering or repairing. It is likely that the word dressmaker covered men, women and children’s wear, and was considered a casual family occupation. The image below is called Horseshoes, painted in the 1850s by local artist John Buckingham. The view is looking west towards the crossroads. The Three Horseshoes is on the left. In the distance is the Tom & Jerry beer house and the toll house. The cottage on the right occupied a strip of land in front of where Notcutts Garden Centre is now. 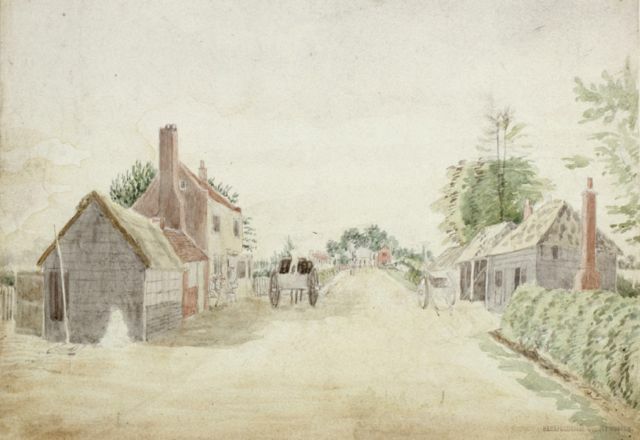 Image courtesy of St Albans’ Museums. My four times grand parents William Sinfoil and his wife Sarah Hill lived on this road in 1841 and are on the 1841 census about 2 houses before the Three Horseshoes pub. Their daughter Emma married John Simpkins, an agricultural labourer in 1843. John lived next door to the Sinfoils. John and Emma are in the next few census when Emma died in 1861 aged 37.